Last updated 4/3/2009 by David Giblin. Publication: Sp. Pl. 1: 445. 1753. Notes: FNA4: "A. P. Simopoulos and N. Salem Jr. (1986) and A. P. Simopoulos et al. (1992) have shown Portulaca oleracea to have the highest content of omega-3 fatty acids and antioxidants of any green leafy vegetable examined to date, suggesting that common purslane should be considered for its nutritional value and not for its weediness. It has long been used as fodder and may have been present in the New World in pre-Columbian times (R. Byrne and J. H. McAndrews 1975). Currently, it is fed to poultry to reduce egg cholesterol. Portulaca oleracea is a highly variable species with worldwide distribution in temperate to warm regions and is the most winter-hardy of all the portulacas. It is a very aggressive weed, one of the ten most noxious weeds worldwide (J. S. Singh and K. P. Singh 1967). As such, many variants have been named (C. D. Legrand 1962) based on seed surface differences, size of seeds, or on variable characters of growth habit, leaf length, and number of stamens. Seven subspecies were recognized by A. Danin et al. (1978): subsp. oleracea, subsp. impolita Danin & H. G. Baker, subsp. granulatostellulata Danin & H. G. Baker, subsp. nicaraguensis Danin & H. G. Baker, subsp. nitida Danin & H. G. Baker, subsp. papillatostellulata Danin & H. G. Baker, and subsp. stellata Danin & H. G. Baker." » Danin, A., I. Baker, and H. G. Baker. 1978. 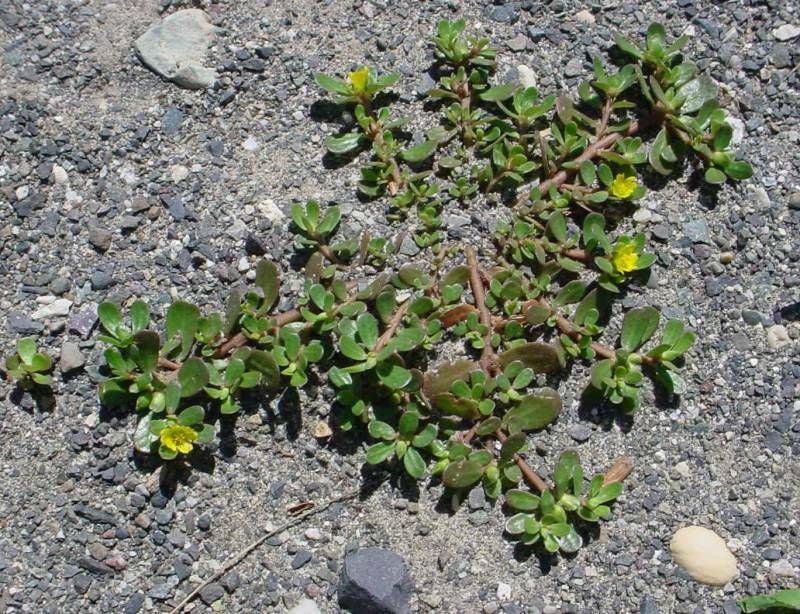 Cytogeography and taxonomy of the Portulaca oleracea L. complex. Israel J. Bot. 27: 177-211.